The name pretty much says it all. 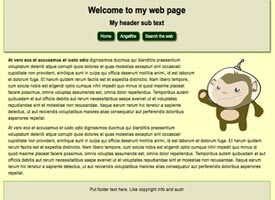 The Basic Template is just that, a basic website using inline CSS styling and minimal HTML tags. The images and colors can easily be replaced with your own images and color palette. Right click to download the HTML file. Keep in mind, you are downloading the HTML file only, NOT the images. Or simply copy and paste the below code into the Advanced Web Shell Editor. The below code does not contain comments. The Stationary Template is designed for those looking to emulate letterhead on the web. The page uses <hr /> tags to create the horizontal rules, and inline CSS to give them different widths. CSS indenting will give each new paragraph a first line indent, and differnet font families help make the heading and body text have clear distinctions from each other. The colors can easily be replaced with your own. The One Column Layout template is a basic CSS/div created layout. All the CSS shows up at the top of the document. 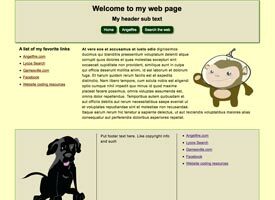 There are three main areas in this template: the header, the content area and the footer. A horizontal navigation bar has been created and P tags are used for the text. This template also includes a floated right image placeholder. The Two 50% Column Layout template is a CSS/div created layout. All the CSS shows up at the top of the document. There are five main areas in this template: the header, the content area which contains the left and right column divs, and the footer. A horizontal navigation bar has been created and P tags are used for the text. This template also includes a floated right image placeholder. As well as an unordered list containing various links. 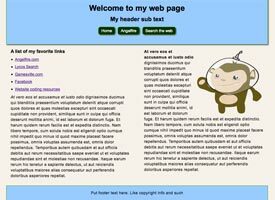 The 2 Column Left Sidebar Layout template is a CSS/div created layout. All the CSS shows up at the top of the document. 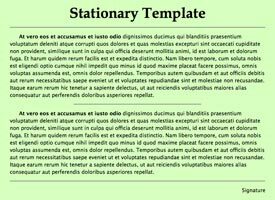 There are five main areas in this template: the header, the content area which contains the right column and left sidebar divs, and the footer. A horizontal navigation bar has been created and P tags are used for the text. This template also includes a floated right image placeholder. As well as an unordered list containing various links. 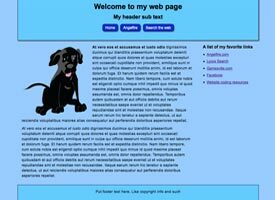 There are five main areas in this template: the header, the content area which contains the left column and right sidebar divs, and the footer. A horizontal navigation bar has been created and P tags are used for the text. This template also includes a floated left image placeholder. As well as an unordered list containing various links. 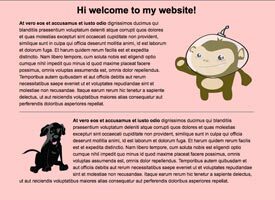 The 2 Column Left Sidebar - 3 Column Footer template is a CSS/div created layout. All the CSS shows up at the top of the document. There are eight main areas in this template: the header, the content area which contains the right column and left sidebar divs, and the footer which contains three floated divs. A horizontal navigation bar has been created and P tags are used for the text. This template also includes floated right and left image placeholders. As well as two an unordered list containing various links. The 2 Column Right Sidebar Multi-Background template is a CSS/div created layout. All the CSS shows up at the top of the document. 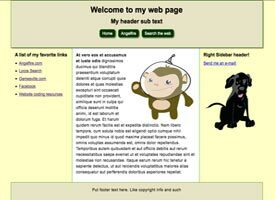 There are seven main areas in this template: the header, the content area which contains the left column and right sidebar divs, and the footer. There are two additional divs (outerContainer and container) which hold all the previously mentioned areas, and are what enables multiple background colors (or images) to be displayed on the website. A horizontal navigation bar has been created and P tags are used for the text. This template also includes a floated right image placeholder. As well as an unordered list containing various links. The 3 Column Layout template is a CSS/div created layout. All the CSS shows up at the top of the document. 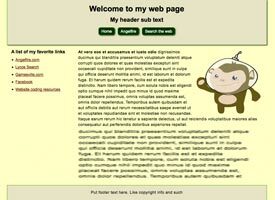 There are six main areas in this template: the header, the content area which contains the right and left sidebar divs with a middle column div, and the footer. A horizontal navigation bar has been created and P tags are used for the text. This template also includes a floated right image placeholder, as well as a normal image placeholder. An unordered list containing various links and a link that when clicked, will open an e-mail program to the address you include.